Recruitment has never been a gender-specific industry. It’s not an industry you would say ranks low in terms of equal opportunities for women. Or does it? Yes, we might see a lot of women within recruitment, but are a lot of them taking up leadership roles? We sit down with Sunny Ackerman, a woman who is often found pioneering the discussion and promotion of women in the workplace. With more than 20 years of staffing experience, she is recognized by the Global Power 100 as one of the most influential women in staffing. 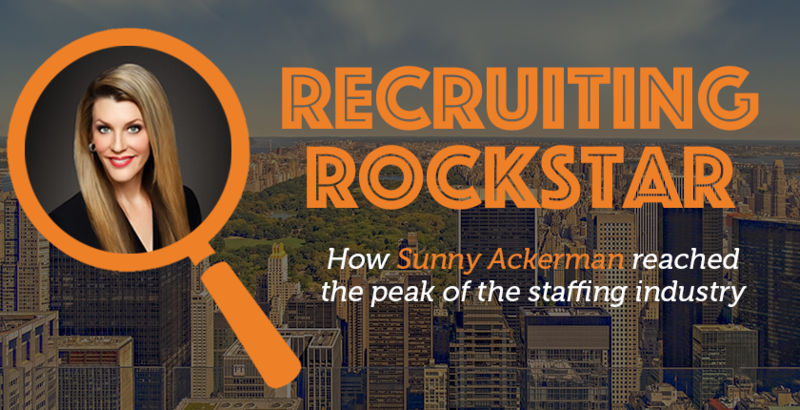 My name is Sunny Ackerman, and I’m President of Americas at niche technology recruitment firm Frank Recruitment Group. I’m responsible for overseeing the company’s presence across the Americas; at the moment, we have four offices in North America, and I’ll be working to expand our reach, and increase our headcount across the country. Why does it matter that things like the Global Power 100 exist? The majority of HR professionals are women, but when it comes to leadership, we’re enormously outnumbered. The Global Power 100 works towards leveling the playing field, by offering a platform from which the women leading the way in our industry can share their stories. Visibility is essential; there are so many women doing amazing things in staffing, and the more we shout about them, the more women will be able to picture themselves doing similar things. The Global Power 100 offers that visibility. It’s not a competition; it’s a celebration. Tunnel vision can certainly be an issue for some recruiters. New developments are causing previously non-existent skill sets to emerge all the time, and often, those skills sets come into demand by clients before the market has had a chance to produce enough candidates. In order to bridge some of these gaps, recruiters need to expand their focus. Thinking about a candidate’s transferable skills, and future potential can be just as significant as hard skills when it comes to filling challenging roles. Are they willing to learn? These are questions that more recruiters need to ask themselves to keep up with demand in an ever-changing market. Recruiters face a lot of rejection. Working in staffing, you’re essentially doing a sales-lead job, but with an especially high number of variables, and no matter what you do, there are going to be times when things don’t go your way. Setbacks aren’t always easy to swallow, but you can’t afford to take knocks to heart. Recruitment is full of ups and downs, but the only way you’re going to be successful is to remain consistent in the face of challenges. That takes a lot of grit and determination, but if you want to succeed in the staffing industry, you need to get back on the horse quickly, every time. Think outside the box. It’s not always about finding a candidate identical to the profile the client has generated; that person might not even exist. Solving hiring problems, especially in the face of talent shortages, takes a little bit of creativity. Follow through. Never make promises that you can’t keep; integrity is paramount in the recruiting business, and if you want to forge lucrative, long-lasting relationships with your clients and candidates, you need to reinforce your reliability at every stage. Listen more than you talk. You won’t get anywhere by putting words in mouths. Finding out as much information as you can about the role and your potential candidates will put you in the best position to make a great match. I’m inspired by people who are actively working to create a better, more inclusive workplace for their industries; people like Trish Barber, who founded Women in Technology. Trish has been a leading force in digital media and technology for years and is just one of the many amazing women who are using their success to give the next generation of female professionals in fields such as IT and tech a hand up. In the digital age, it’s easier than ever for clients to find candidates themselves, but much more difficult for them to qualify them. The skill sets in demand by clients are changing so rapidly, especially in the tech industry, that clients don’t always know what they’re looking for. That digitization of hiring is only going to continue, so if recruiters want to remain relevant to their clients, they need to be offering real value; being experts in their field, knowing where to find candidates that clients can’t reach on their own, and having an eye for potential that will help bridge skills gaps.